Getting started with Standard Notes is easy. But there are powerful features you might want to know about if you're going to get the best out of your experience. 1. Get started with your free, encrypted sync account. Your sync account lets you access your notes no matter which device you're on. Creating a sync account also creates a strong encryption key derived from your password. Set up an account by clicking "Account" in the lower left menu of the app. This will also automatically enable end-to-end encryption, which means your notes are encrypted using your secret key on your device before they're synced to your online account. No one can decrypt your notes: not us, not your ISP, and not an intrusive government. This type of security also means that there is no way to reset your password if you forget it. You can change it once logged in, but you can't say "I Forgot", or else you'll lose access to your data for good. 2. Download Standard Notes on all your devices. Use the desktop applications for a powerful writing experience, or the mobile apps for quick and easy access to your notes wherever you are. 3. Download periodic backups of your data. Encrypted: Encrypted backups download a Standard Notes specific data file that can be used to reimport back into Standard Notes into the future, or transfer your notes to a different account. These files can also be decrypted offline with a decrypt script you can download here. Decrypted: On Desktop and Web, the decrypted option will download two things. The first is a zip file containing all your notes in plaintext. These files contain no Standard Notes specific metadata, and are used for your own records. The second is a single Standard Notes backup file that you can use for your own archives, or use to re-import into Standard Notes in the future. You can also set up Extended, which automatically backs up your encrypted data to Dropbox, OneDrive, and Google Drive, and also saves the encrypted history of your notes so you can restore to previous versions in case you mess something up. 4. Extend your experience with Extensions and Themes. Visit the Extensions page to discover all the powerful ways you can customize your experience. You can customize your Desktop and Web experience with powerful extensions and editors. Check out the Advanced Markdown Editor, or, if you're a developer, the Code Editor. 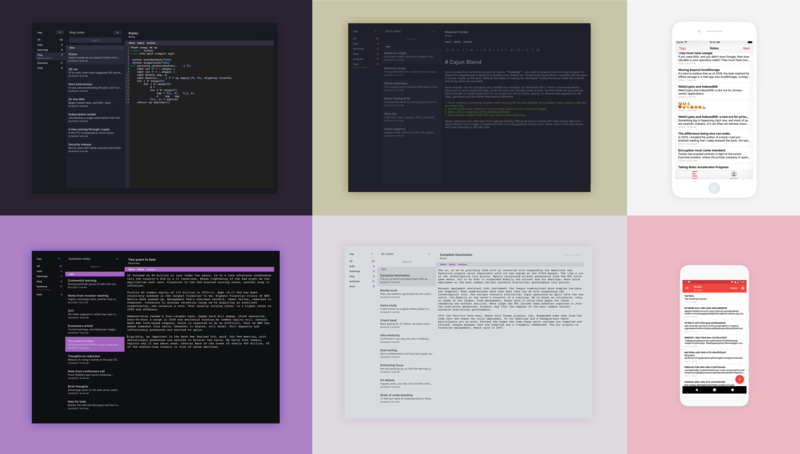 For night-time writing, check out the Midnight theme. 5. Need help? We're here for you. Find some frequently asked questions as well as ways to get in touch on the Help page. Meet other passionate note-takers and privacy enthusiasts. Find us here if you need anything. We believe in making privacy easy for everyone. Help us sustain by spreading the word.